Hanging out on the beach tops the list of most North Myrtle Beach visitors who venture to the area for a fabulous beach vacation. So staying on the oceanfront is a key component for the beach lovers. Coastal Shores is a North Myrtle Beach resort that is right on the beachfront. Follow the sandy path that leads to the beautiful oceanfront and admire the stunning views. As your bare feet sink into the powdery sand and when you let the warm ocean water rush over your toes you will be fully relaxed. Watching the horizon where the blue of the sky meets the turquoise sea is a mesmerizing scene. The lull of the waves crashing ashore is soothing and the hope of seeing dolphins swim by just offshore keeps you entranced on the water’s ripples. North Myrtle Beach, SC is an inviting, family-friendly destination for beach vacations and Coastal Shores has all the charm of an oceanfront resort located in the South. This North Myrtle Beach resort is in a fantastic location. Main Street in the Ocean Drive section of North Myrtle Beach, SC is right down the street, just eight blocks away. Walk to the shops and dine at the cafes. Listen to beach music at the beach clubs in the Ocean Drive section of town. Travel further north on Ocean Boulevard and you will run into the Cherry Grove Fishing Pier and the tranquil salt marsh and inlet. Highway 17 is the main thoroughfare through town and it is just a couple blocks to the west and the Intracoastal Waterway is just a couple blocks further west from that roadway. 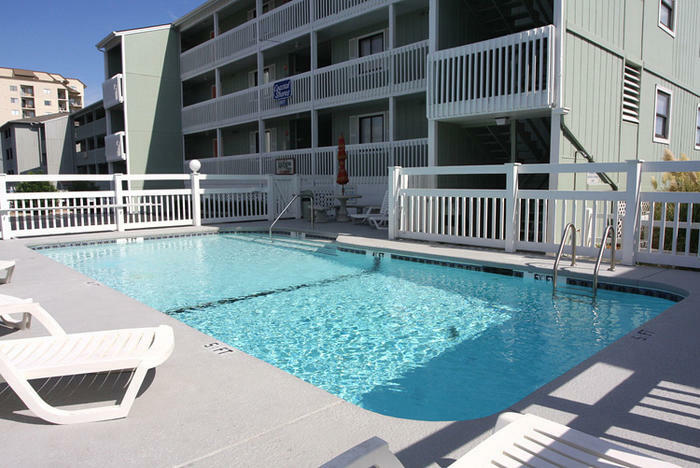 Coastal Shores is centrally located and that is a real amenity to your North Myrtle Beach vacation. How about a two-bedroom, two-bath North Myrtle Beach vacation rental that sleep six people for your next North Myrtle Beach vacation? With far more furnishings and features than a typical hotel room, the North Myrtle Beach vacation rentals at Coastal Shores are well-equipped condominiums that have a fully furnished kitchen, private bedrooms and more than one bath! Indulge in all the space and take advantage of every amenity found on site at this North Myrtle Beach resort. Inside these condominiums in North Myrtle Beach, South Carolina you will immediately discover a nicely furnished kitchen that comes with full-size appliances, cookware and dishes. There is even a dishwasher in these kitchens so you will be fully spoiled during your North Myrtle Beach vacation. Amenities in each private North Myrtle Beach condo rental at Coastal Shores includes a washing machine, clothes dryer, DVD player and oceanfront balcony. There is high-speed Internet access available at Coastal Shores, too. The private balcony in each of these North Myrtle Beach vacation rentals is accessed through the sliding glass door in the living room. The dining area and kitchen also have views of the ocean through the balcony so regardless of where you are in these North Myrtle Beach condominiums, the Atlantic Ocean and white sandy beaches will likely be within sight. The panoramic views from the master suite in each of these condos in North Myrtle Beach, SC are stunning. Crack open the windows or the balcony door and let in some fresh sea air and listen to the ocean waves crash ashore throughout the night. The blue swimming pool at Coastal Shores is a great place to relax during the daytime. The sunshine glistens on the water and invites everyone in for a swim. The swimming pool is on the front side of this North Myrtle Beach resort and is fenced in. You can see Ocean Boulevard from the pool area and sun deck. Lounging by the pool is therapeutic. Bring your favorite books and magazines and write postcards to folks back home as you dangle your legs in the refreshing water and keep an eye on the kids while they splash and play. Shopping, dining and live entertainment theatres are in close proximity to Coastal Shores and there are more than 100 Myrtle Beach area golf courses in town, too. So whether you want to visit the outlet malls and grab some terrific name-brand fashions and amazing prices or if you want to take a culinary tour of the North Myrtle Beach, South Carolina area, you can. Rent a Sea Doo and have a blast on the ocean or cast a line into the water from a fishing pier. Go hiking on some nature trails at the local state parks and take a picnic to a quiet waterfront locale. Parasailing, the Myrtle Beach SkyWheel, dinner theatres, water slides and an oceanfront amusement park that features rides for all ages is part of the fun when you make reservations for a Myrtle Beach area vacation. Reserve Coastal Shores today and pack your bags tomorrow!